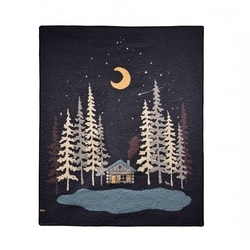 This rustic and charming quilted bedding collection displays a little cabin nestled in a pine forest under a moonlit, starry night. 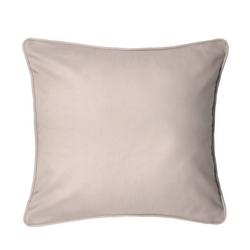 Deep charcoal, shades of slate gray, khaki and soft gold add a gentle outdoor touch to your decor. 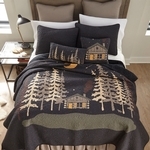 King Quilt: 110 x 96"
Full/Queen Quilt: 90 x 90"
Twin Quilt: 68 x 90"
King Quilt 3 piece set: - Quilt 110 x 96, 2 King Sham: 20 x 36"
Full/Queen Quilt 3 piece set:- Quilt 90 x 90", 2 Standard Sham 20 x 26"
Twin Quilt 2 Piece Set- Quilt 68 x 90", 1 Standard Sham 20 x 26"
1 Dec Pillow (rect) 11" x 22"
Full/Queen Quilt 5 Piece Set -:Quilt 90 x 90", 2 Standard Sham: 20 x 26", 1Dec Pillow: 18 x18",1 Dec Pillow (rect): 11" x 22"
Twin Quilt 4 Piece Set - Quilt 68" x 90", 1 Standard Sham: 20" x 26", 1 Dec Pillow 18"x18", 1 Dec Pillow (rect) 11" x 22"
DS 61209 - Midnight Cabin Valance 15" x 56"
Complete your Midnight Cabin Bedding Ensemble with a Coordinating Euro Shams! 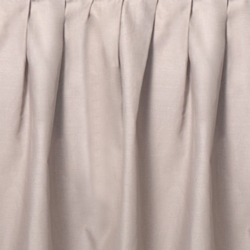 Complete your Midnight Cabin Bedding Ensemble with a Coordinating Bedskirt! 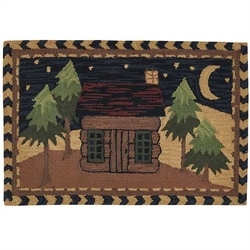 Twin Bedskirt: 39" x 75" x 18"
Full Bedskirt: 54" x 75" x 18"
Queen Bedskirt: 60" x 80" x 18"
Our Moonlit Cabin hooked rug features a log cabin in the woods under a starry sky and is perfect for creating a warm, cozy home It's ideal for your cabin, lakehouse or RV. Handcrafted, hooked polyester yarn. 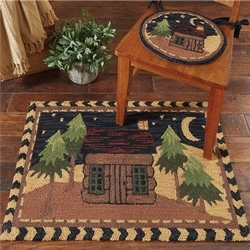 The rug features a higher pile height for better durability and a more luxurious look. Best of all, the rug is machine washable. 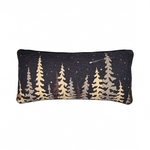 Complete the look with the matching chair pad and coordinating pillows. A non-slip rug pad is recommended to prevent sliding on smooth surfaces (not included). 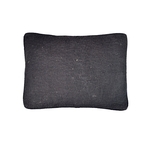 Matching chair pad, and coordinating pillows are also available and are shown in photos (sold separately). 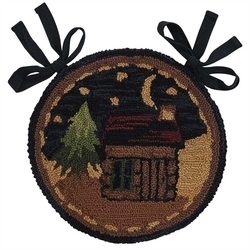 Our Moonlit Cabin Hooked Chair Pad features a log cabin in the woods under a starry sky. 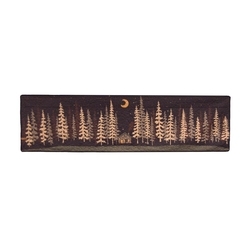 Deep woodsy colors with a black border and ties. Made from poly loop yarn, each pad is hand-hooked and features space dyed yarns to create natural variations in color patterns. 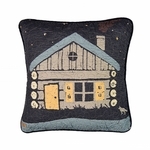 Complete the look with the matching rug and coordinated pillows (sold separately.) Set of 2.